Inmiddels is het studierapport van de Nederlandse oncoloog Bart Groot Koerkamp online gepubliceerd in het Journal of Clinical Oncology. Het abstract staat onderaan dit artikel. Het Algemeen Dagblad komt vandaag 21 april 2017 met een ervaringsverhaal van een Nederlandse man, Cas Renders die al in 2000 met HAIP - hepatic arterial infusion pump therapy is behandeld in het Memorial Sloan Kettering in New York voor zijn in de lever uitgezaaide darmkanker en in 2000 nog slechts een levensverwachting van drie maanden kreeg. En met succes want hij is 17 jaar later (hij is nu 54 jaar) nog steeds kankervrij. Een mooi ervaringsverhaal maar de manier van behandelen wordt al heel lang toegepast in Amerika. HAIP - hepatic arterial infusion pump therapy is al een oude techniek die vooral in Amerika veel wordt toegepast. Vooral bij primaire leverkanker maar ook bij operabele in de lever uitgezaaide darmkanker. In feite is dit TACE - chemo embolisatie zoals ook dr. Vogl die toepast maar omdat het pompje in de lever wordt geplaatst bij de operatieve verwijdering van de tumoren kan deze chemo embolisatie zonder extra belasting voor de patiënt om de twee weken worden uitgevoerd. In this review, we discuss surgical treatment and associated outcomes in the treatment of CRLM. In addition, the role and efficacy of HAI therapy are examined. Finally, we outline how genetic profiling and mutational analysis can impact management of this disease in this era of molecular-based targeted therapies. Abstract sataat hieronder met referentielijst. Cas Renders (54) uit Amsterdam is het levende bewijs. In 2000 – op zijn 38ste – gaven artsen hem 4 procent kans om te overleven ,,Of wel: over 3 maanden bent u er niet meer.” Hij gaf niet op en kwam bij kankercentrum Sloan Kettering in New York terecht. Het volledige studierapport Hepatic resection, hepatic arterial infusion pump therapy, and genetic biomarkers in the management of hepatic metastases from colorectal cancer is gratis in te zien. HAI chemotherapy has also evolved, and provides a unique and effective therapy both in the unresectable setting and as an adjuvant therapy following resection seemingly beyond that of systemic therapies alone. J Gastrointest Oncol. 2015 Dec; 6(6): 699–708. The liver is the most common site of colorectal cancer metastasis. Fortunately, improvements have been made in the care of patients with colorectal liver metastasis (CRLM). Effective management of CRLM requires a multidisciplinary approach that is tailored to individuals in order to achieve long-term survival, and cure. Resection and systemic chemotherapy provides benefit in selected individuals. 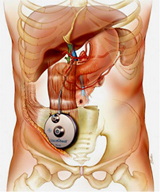 An adjunct to resection and/or systemic chemotherapy is the use of hepatic arterial infusion pump (HAIP) therapy. Many studies show HAIP provides benefit for select patients with CRLM. Added to the crucible of a multidisciplinary approach to managing CRLM is the ever growing understanding of tumor biology and genetic profiling. In this review, we discuss the outcomes of resection, systemic therapies and HAIP therapy for CRLM. We also discuss the impact of recent advances in genetic profiling and mutational analysis, namely mutation of KRAS and BRAF, for this disease. During the last three decades, there has been progressive improvement in the management of CRLM. 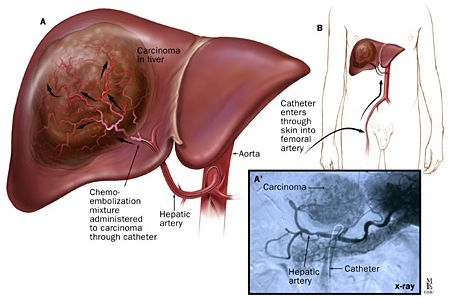 Hepatic resection is performed with low risk at high-volume specialized centers, and has been established as the standard of care for resectable disease with associated prolonged survival and potential for cure. Likewise, systemic therapies have improved, with the advent of novel cytotoxic systemic chemotherapeutic agents. Furthermore, targeted therapies are now applied to contemporary drug regimens and have modestly improved outcomes in patients with mCRC. HAI chemotherapy has also evolved, and provides a unique and effective therapy both in the unresectable setting and as an adjuvant therapy following resection seemingly beyond that of systemic therapies alone. Multidisciplinary care for each patient with CRLM is crucial to orchestrate the multiple management strategies to extent survival. Combining clinical features with molecular profiling may provide superior prognostication for patients with CRLM. The promise of individualized therapy, tailored according to specific genetic mutations and disease patterns, is now being realized and continues to evolve. 50. Kemeny N, Chou J, Boucher T, et al. 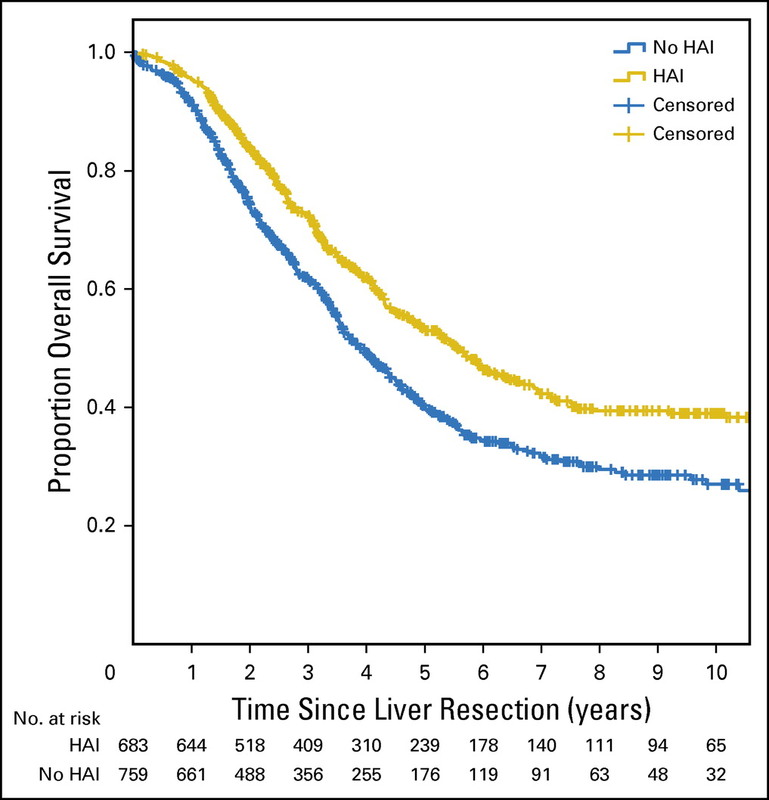 Improvement in long-term survival in patients with metastatic colorectal cancer (CRC) after liver resection with modern chemotherapy and hepatic arterial infusion (HAI). J Clin Oncol 2015;33:abstr 3563. Bas Groot Koerkamp, Eran Sadot, Nancy E. Kemeny, Mithat Gönen, Julie N. Leal, Peter J. Allen, Andrea Cercek, Ronald P. DeMatteo, T. Peter Kingham, William R. Jarnagin, and Michael I. D’Angelica, Memorial Sloan Kettering Cancer Center, New York, NY; Bas Groot Koerkamp, Erasmus MC Cancer Institute, Rotterdam, the Netherlands; and Eran Sadot, Rabin Medical Center, Petah Tikva, and Tel Aviv University, Tel Aviv, Israel. To investigate whether perioperative hepatic arterial infusion pump chemotherapy (HAI) was associated with overall survival (OS) in patients who had a complete resection of colorectal liver metastases (CLM). Patients who underwent a complete resection of CLM between 1992 and 2012 were included from a single-center prospectively maintained database. All patients who received HAI also received perioperative systemic chemotherapy. Propensity score analysis was used to match patients for seven known prognostic factors. A total of 2,368 consecutive patients underwent a complete resection of CLM, with a median follow-up of 55 months. The median OS for patients with HAI (n = 785) was 67 months versus 44 months without HAI (n = 1,583; P < .001), despite more advanced disease in the HAI group. OS at 10 years was 38.0% versus 23.8% without HAI. For patients who received modern systemic chemotherapy (n = 1,442), the median OS was 67 months with HAI and 47 months without HAI (P < .001). The hazard ratio adjusted by propensity score demonstrated longer OS with HAI: 0.67 (95% CI, 0.59 to 0.76; P < .001). A pronounced difference in median OS was found for patients with node-negative colorectal cancer (129 months with HAI v 51 months without; P < .001) and a low clinical risk score of 0 to 2 points (89 months with HAI v 53 months without; P < .001). 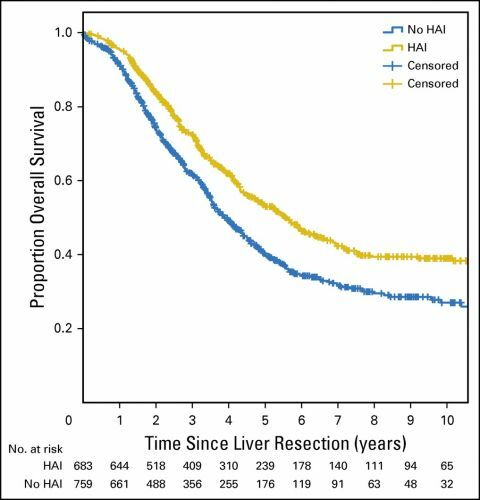 Patients who received HAI had a median OS of approximately 2 years longer than patients without HAI. The strong association was independent of the use of modern systemic chemotherapy and remained in propensity score analysis. Patients with node-negative primary tumors or a low clinical risk score seemed to benefit most from HAI. 2 Reacties op "HAIP -(hepatic arterial infusion pump), chemo embolisatie via in lever geplaatste pomp verlengt leven van patienten met darmkamker met uitzaaiingen in de lever mediaan met 2 jaar." Ik ben momenteel met mijn derde chemotherapie bezig. Laat u ons wat weten mocht het gelukt zijn?